Workforce Analysts are basically involved in analyzing and evaluating workforce metrics as a way to develop human resource capacities and maximize the labor utilization rate. Workforce Analyst Resume should include the following roles and responsibilities – forecasting the workforce requirements, scheduling reports based on the findings and collaborating with other teams to optimize human resources for the purpose of satisfying the business goals. These experts apply analytical models and projections to improve workforce decision-making. Workforce Analysts should be familiar with MS Office and have ample experience in Siebel, Blue Pumpkin, IEX, TCS or any other workforce management software. While a Degree in Computer Science, IT or Business Administration gives a competitive edge, most of the hiring employers’ lookout for a combination of formal computer training and call center experience from their potential Workforce analysts. 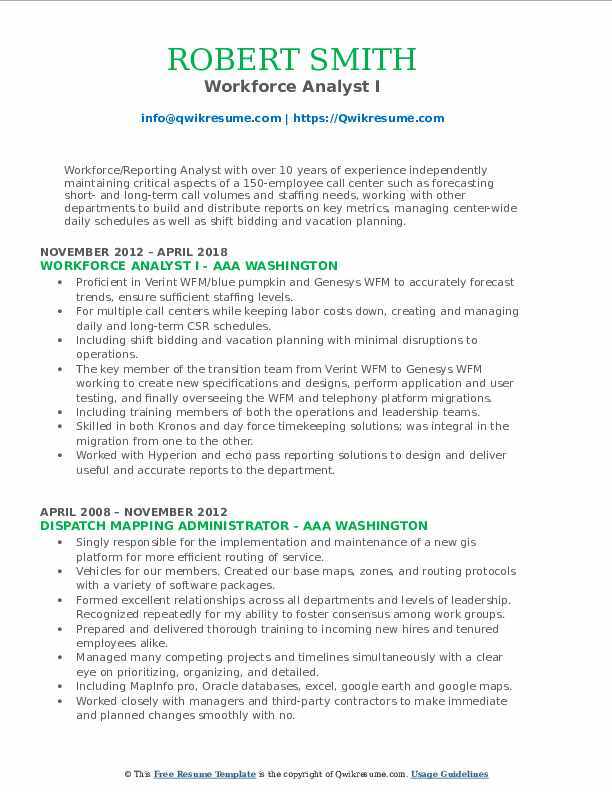 Summary : Workforce Analyst offering 11 years of diversified experience. Excellent communication and problem-solving skills. Dedicated to achieving customer satisfaction as well as meeting or surpassing company expectations. Able to focus on projects, develop strategies and meet or exceed deadlines. Skills : Competent Using Software Including Windows, Word, Excel, Lotus Notes, PeopleSoft, Siebel, E-mail, And The Internet. Working Knowledge Of E Workforce Management, Online Timecard Payroll, Touchpoint And Centre Vu. Developing interval level forecasts for multiple lines of business organized across several sites. Responsible for understanding/tracking historic contact volumes and influencing events. Working closely with various departments to stay informed about pending or current activities that may change the volume trends, and re-develop workforce forecasts to reflect these changes. Providing reports to management and communicates reasons for variances with recommendations to improve performance. Reviewing intra-day performance (IDP) accuracy, update EWFM inputs to achieve forecasts within stated goals. Maintaining historical growth forecasting monthly updates and adjustments. Maintaining weekly year over year metric tracking to aid in developing forecasts. Leveraging data from previous initiatives, pilots, and business recommendations to develop educated assumptions/forecasts for planned initiatives. Maintaining and update holiday factors to account for volume impacts, create ad-hoc reports as needed. Analyzing current processes and proactively recommend changes to increase efficiencies. Providing assistance to other scheduling/forecasting analysts as needed in a team environment. Summary : A highly motivated manager and analyst professional with a verifiable record of accomplishment spanning over 7 years in the telecommunication sectors of financial, retail, and automotive industries. Skills : Microsoft Office: Excel, PowerPoint, Access, And Outlook Oracle: Peoplesoft, NATA Forecasting/Scheduling: IEX TotalView, CMS Avaya, RTA, EWFM/Aspect/ESP, Symposium, Blue Pumpkin/Verint IVR System: Access Point Accounting: Quickbooks And Timberline Client Systems. Restoration hardware serves as a curator for luxury home furnishings operating through multiple channels of distribution to offer an unmatched combination of inspired design, high-quality furnishings, and décor while instilling unparalleled vision and values. Successfully initiating performance-based scheduling bids for frontline and backend lines of businesses within a multi-site contact center. Identifying and addressing new and developing scheduling/staffing needs through reviews and evaluations of processes and provide coverage for all events. Developing a schedule quality process to ensure consistency and accuracy of schedule bids and schedule modifications. Built/increasing knowledge base through education of systems and production solutions in alignment with policies and procedures. Developing/documenting policies and procedures through sops to ensure consistency across the multi-site center. Provide team leadership through direct coaching/mentoring and benchmarking team activities in support of corporate objectives. Completing daily activities to manage staffing and service level needs for a multi-site contact center environment. Managing real-time adjustments, advised and forecasted potential opportunities, and made recommendations to ensure business strategic goals are met. Analyzing and recommend staffing plans identifying optimal schedules and recommendations for ongoing adjustments and improvement to staff levels, skill groups and capacity plans. Utilizing strong analytical and critical thinking skills to communicate opportunities to assist in balancing the business needs. Completing audits through quality control to maintain regulatory processes and procedures. 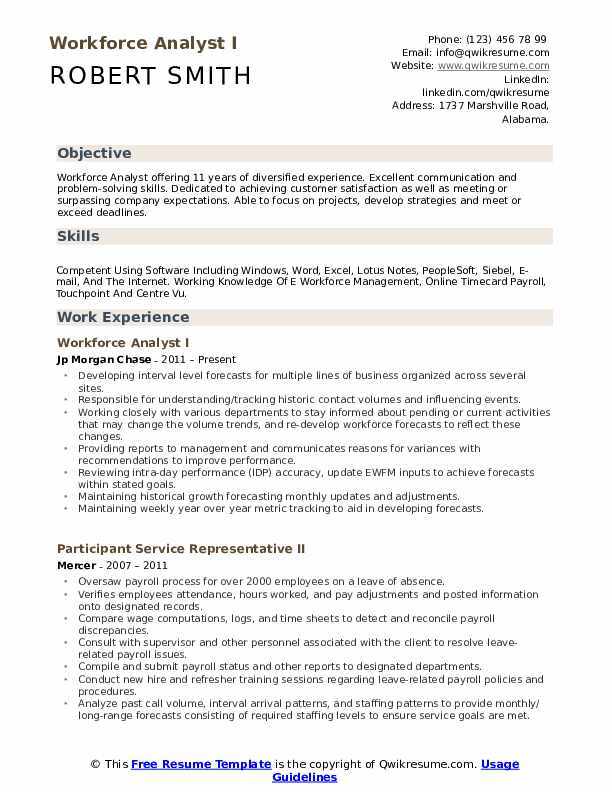 Objective : 4+ years of experience as a Workforce Analyst is seeking to obtain a position with a company where I can utilize my organizational, multitasking and software skills. Skills : EWFM, IEX, CMS, Empower/Aspect, Real-Time Adherence, Excel, SQL, Customer Service, Analytics, Forecasting, ETS, Sharepoint, Strategic Planning, Data Analysis, And Kronos. Responsible for maximizing occupancy and service level through real-time and intraday monitoring of an analysis of contact volumes and AHT to forecast, management of staffing to requirements, adjustments to staff requirements (including OT and VTO), setting primary/secondary/reserve skilling, maintain staffing line adherence, and coordination of decentralized workforce management resources for outsourcer and charters virtualized contact centers. Updating intraday (interval) contact volume and average handle time for all call types and contact centers based on global forecasts and real-time trends. Make manual adjustments in EWFM to account for out-of-pattern days, including days after holidays, PPV events, or outages. Adjusting, in EWFM, next day forecasts to reflect the current view of staffing requirements. Enter updates into the WFM portal to adjust staffing needs as required. Negotiate with sites, as necessary, for new staff attainment (including best effort OT and VTO) to maximize service level and occupancy. Monitoring and managing intraday staffing in internal and outsourced contact centers to ensure balancing of staff requirements (attaining similar OT and VTO goals in proportion to existing staff and currently attained OT and VTO) and compliance to forecast agreements. Provide guidance and coordinate internal and outsource workforce management teams in administering realtime overtime and voluntary time off activities. Communicating with internal local staffing and outsource centralized teams to identify trends in absenteeism, turnover, and other events impacting staffing availability. Making real-time adjustments to staffing forecasts in EWFM, including shrinkage, to provide the most accurate and up-to-date view of staffing forecast to requirements. Instructing and coordinating optimal intraday scheduling of team meetings, supervisor coaching sessions, training and other scheduled off-phone (shrinkage) activity. Monitoring real-time call statistics schedule adherence and communicate with internal and outsource workforce management teams to ensure on-phone and off-phone activity is managed efficiently throughout the day. Developing and communicating intraday service level and occupancy analysis to highlight events that cause care to miss the goal in any contact type. Such analysis should be thorough, self-explanatory, and detailed as to the cause of the miss (location, subscribers impacted, duration, trouble ticket number, posting of an announcement), the quantified impact of the miss (both for the interval(s) and day), and expected time for resolution. Escalating service level and occupancy miss issues to the necessary manager, director or vice president level, based on time frame and impact. 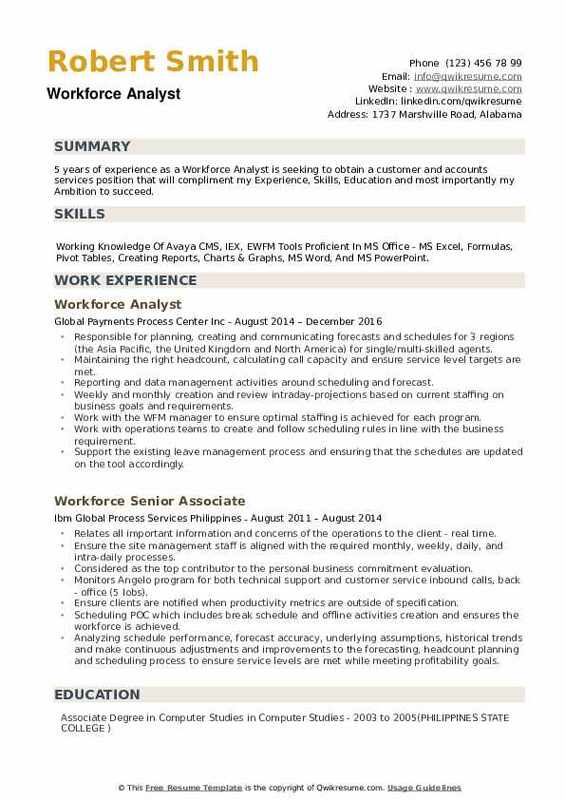 Objective : 2 years of experience as a Workforce Analyst. Dependable, ethical and efficient college graduate with a Bachelor of Science in Business Administration with a concentration in Health Services Management. Known for strong strategic analysis, research, high attention to detail and multi-tasking abilities. Skills : Excel, Office Administration, Project Management, Type 45 WPM, Health Services Management, File Management, Workforce, Excellent Customer Service, Health Insurance, Strong Written & Verbal Communication, And Mastery Of Microsoft Office Programs. Oversee real-time performance issues and implement contingency actions in event of forecast deviating from the real-time scenario. Provide guidance, background information, and assistance to management and other staff on the analysis and interpretation of process performance data. Develop a working level of knowledge of the call center to define, optimize, automate and manage business processes to identify key measures or indicators of process performance and the actions needed to improve or correct performance. Identify, research and manage service level risks related to scheduling and staffing. Monitor operational performance against forecasts and ensure meaningful deviation is detected early and incorporated in operation planning efforts. Ensures hours are accurately accumulated and categorized in a format compatible with the company and department payroll procedures. Processes management requests for modifications of scheduling events (meetings/training, etc. ). 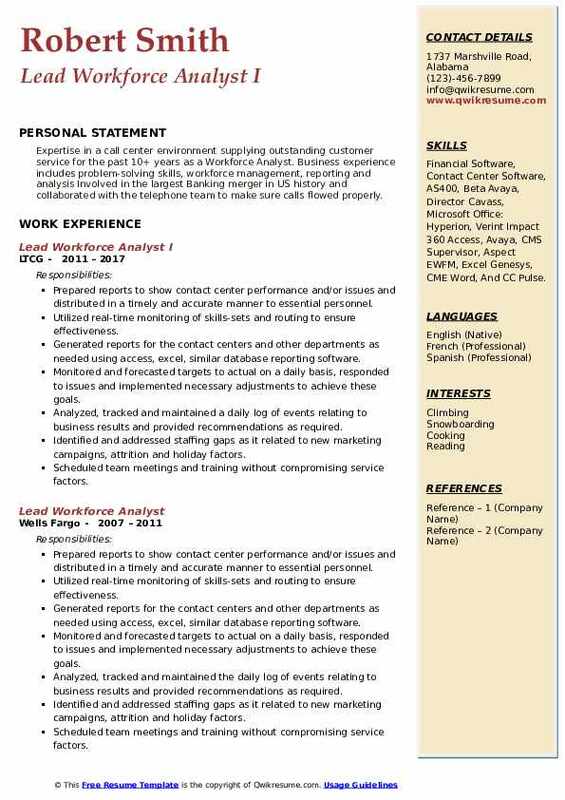 Summary : 8+ years of experience as a Workforce Analyst. Results oriented, committed individual seeking a position within business operations to provide efficient and effective solutions to a progressive company that will enable me to use my strong organizational skills and prior experience to advance my professional career. Skills : Workforce Management Systems (Genesys WFM, WFM Configuration, IEX, CME, Simplicity, Clarify, Total View, E-time) Effectively Interacts With All Levels Of Management And Non-management Team Members, Ability To Analyze Performance Reports, Provide Suggestions And Recommendations. Developing and maintaining workforce management platforms (configurations for skills, call multi-channel routing, associates, historical trends, anomalies, etc. ) multi-channel includes calls (inbound outbound), email and chat. Designing, building and maintaining databases and spreadsheets tracking key service metrics and statistics. Managing updates to configuration and plan enhancements within the workforce management tool to ensure efficient operation and accurate scheduling. Building staffing scenarios and strategies of possible variables that affect staffing and call volume projections. Generating schedules based on forecast requirements and workload. Ensuring adequate staffing to meet performance matrices. Incorporating seasonal variations, training, and special events that impact call volume and AHT. Analyzing and determining shift optimization need based on forecast requirements. Administrating voluntary and compulsory shift-bid processes across multiple business units. Headline : An accomplished professional with 6 years of experience as a Workforce Analyst leading all areas of workforce management including Processes, Scheduling, and Forecasting function in complex organizations. A proven problem solver with the ability to meet demanding deadlines with efficient and effective results. 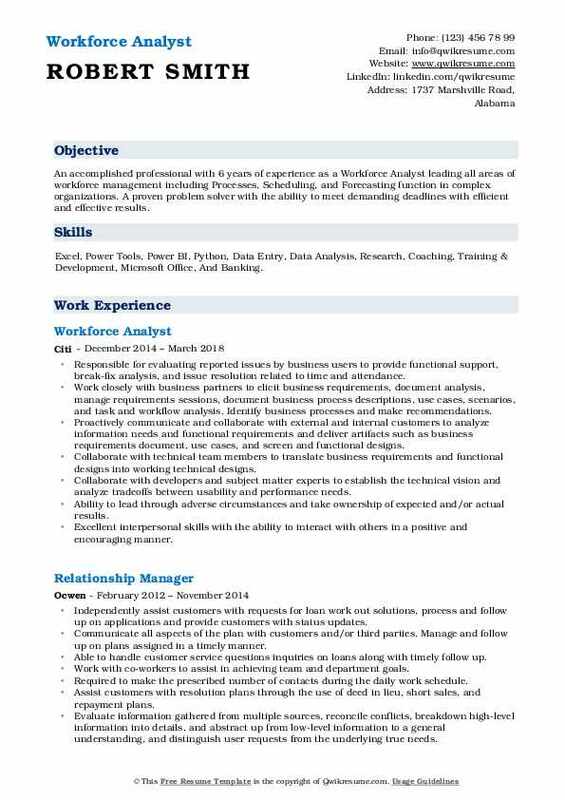 Skills : Excel, Power Tools, Power BI, Python, Data Entry, Data Analysis, Research, Coaching, Training & Development, Microsoft Office, And Banking. Responsible for evaluating reported issues by business users to provide functional support, break-fix analysis, and issue resolution related to time and attendance. Work closely with business partners to elicit business requirements, document analysis, manage requirements sessions, document business process descriptions, use cases, scenarios, and task and workflow analysis. Identify business processes and make recommendations. Proactively communicate and collaborate with external and internal customers to analyze information needs and functional requirements and deliver artifacts such as business requirements document, use cases, and screen and functional designs. Collaborate with technical team members to translate business requirements and functional designs into working technical designs. Ability to lead through adverse circumstances and take ownership of expected and/or actual results. Excellent interpersonal skills with the ability to interact with others in a positive and encouraging manner. Outstanding organizational skills and strong attention to detail with the ability to prioritize and effectively manage competing demands for both time and attention in a fast-paced environment. Effectively prepare and present information to senior management and business partners. Ability to effectively influence others, including senior management and business partners. Proactively lead and oversee the daily operations of assigned business projects. 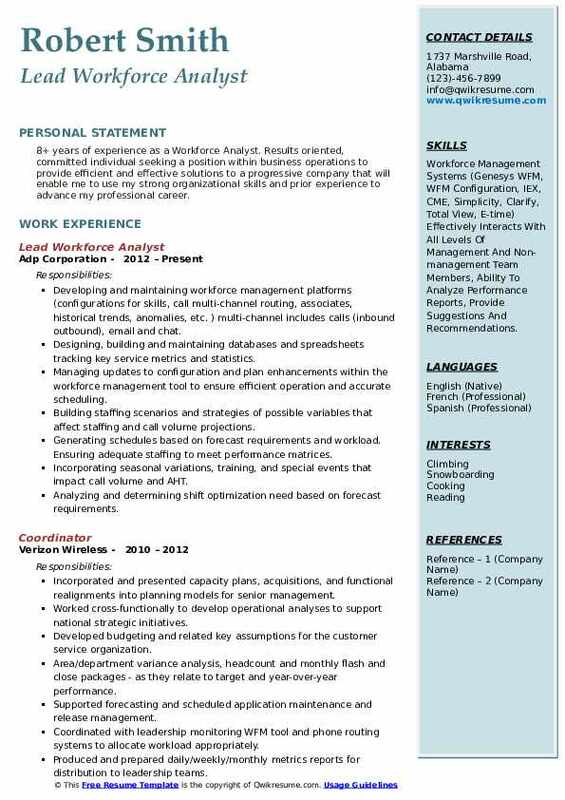 Summary : Workforce/Reporting Analyst with over 10 years of experience independently maintaining critical aspects of a 150-employee call center such as forecasting short- and long-term call volumes and staffing needs, working with other departments to build and distribute reports on key metrics, managing center-wide daily schedules as well as shift bidding and vacation planning. Skills : Microsoft Office, Procurement, Administrative Assistant, Retail Management, Excellent Verbal And Written Communication, Problem Solving, And Risk Management Solutions. Proficient in Verint WFM/blue pumpkin and Genesys WFM to accurately forecast trends, ensure sufficient staffing levels. For multiple call centers while keeping labor costs down, creating and managing daily and long-term CSR schedules. Including shift bidding and vacation planning with minimal disruptions to operations. The key member of the transition team from Verint WFM to Genesys WFM working to create new specifications and designs, perform application and user testing, and finally overseeing the WFM and telephony platform migrations. Including training members of both the operations and leadership teams. Skilled in both Kronos and day force timekeeping solutions; was integral in the migration from one to the other. Worked with Hyperion and echo pass reporting solutions to design and deliver useful and accurate reports to the department. Extensive experience in excel processing large volumes and types of data critical to the workforce departments role in managing the call center staff and providing the leadership team with the data and advice they need to maintain and. Programmed a variety of "middleware" solutions in VBA to link incompatible software platforms or data sources. 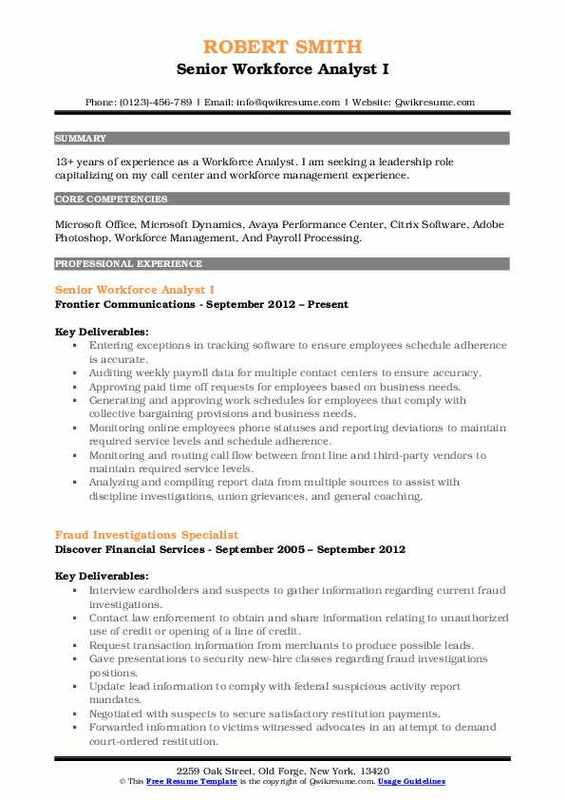 Summary : 13+ years of experience as a Workforce Analyst. 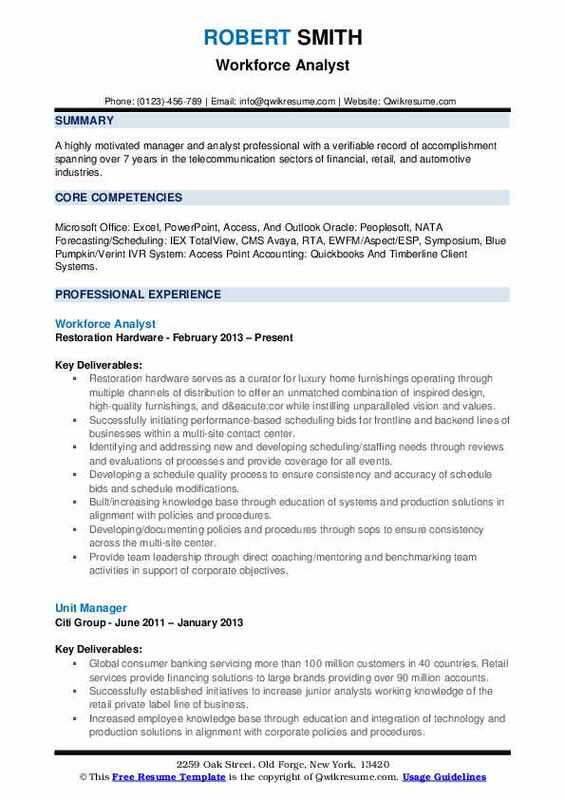 I am seeking a leadership role capitalizing on my call center and workforce management experience. Skills : Microsoft Office, Microsoft Dynamics, Avaya Performance Center, Citrix Software, Adobe Photoshop, Workforce Management, And Payroll Processing. Entering exceptions in tracking software to ensure employees schedule adherence is accurate. Auditing weekly payroll data for multiple contact centers to ensure accuracy. Approving paid time off requests for employees based on business needs. Generating and approving work schedules for employees that comply with collective bargaining provisions and business needs. Monitoring online employees phone statuses and reporting deviations to maintain required service levels and schedule adherence. Monitoring and routing call flow between front line and third-party vendors to maintain required service levels. Analyzing and compiling report data from multiple sources to assist with discipline investigations, union grievances, and general coaching. Opening access tickets for new hires and deactivation tickets for recently terminated employees. Reviewing and approving tickets to update security access within the Microsoft Dynamics CRM platform. Releasing hourly employees early based on budgetary and business needs. Scheduling and tracking completed training to ensure all employees have received the latest industry updates. 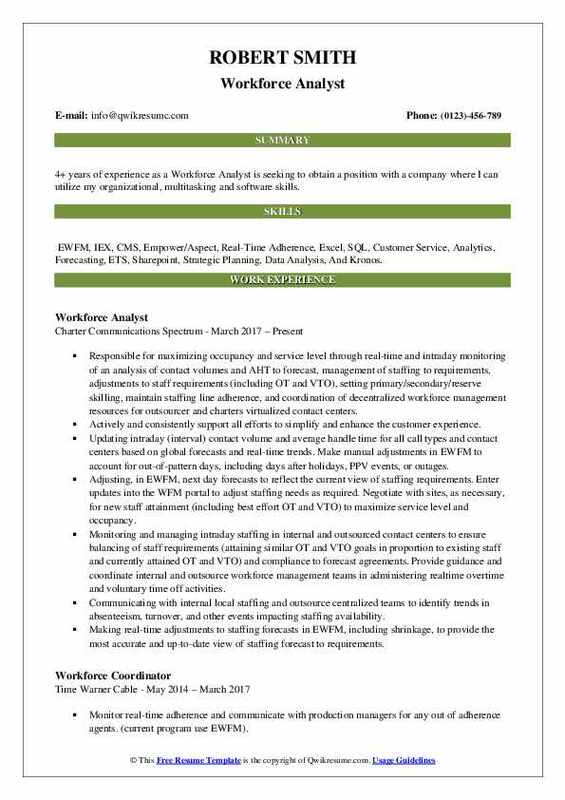 Summary : Expertise in a call center environment supplying outstanding customer service for the past 10+ years as a Workforce Analyst. Business experience includes problem-solving skills, workforce management, reporting and analysis Involved in the largest Banking merger in US history and collaborated with the telephone team to make sure calls flowed properly. Skills : Financial Software, Contact Center Software, AS400, Beta Avaya, Director Cavass, Microsoft Office: Hyperion, Verint Impact 360 Access, Avaya, CMS Supervisor, Aspect EWFM, Excel Genesys, CME Word, And CC Pulse. Prepared reports to show contact center performance and/or issues and distributed in a timely and accurate manner to essential personnel. Utilized real-time monitoring of skills-sets and routing to ensure effectiveness. Generated reports for the contact centers and other departments as needed using access, excel, similar database reporting software. Monitored and forecasted targets to actual on a daily basis, responded to issues and implemented necessary adjustments to achieve these goals. Analyzed, tracked and maintained a daily log of events relating to business results and provided recommendations as required. Identified and addressed staffing gaps as it related to new marketing campaigns, attrition and holiday factors. Scheduled team meetings and training without compromising service factors. Acted as liaison with management to identify gaps and trends associated with agent schedule adherence. Supported special projects to ensure they are completed in a timely and accurate manner. Kept senior leadership informed of important developments, potential problems and related information necessary for effective management. Coordinated/communicated plans and activities with others, as appropriate, to ensure a coordinated work effort and team approach. 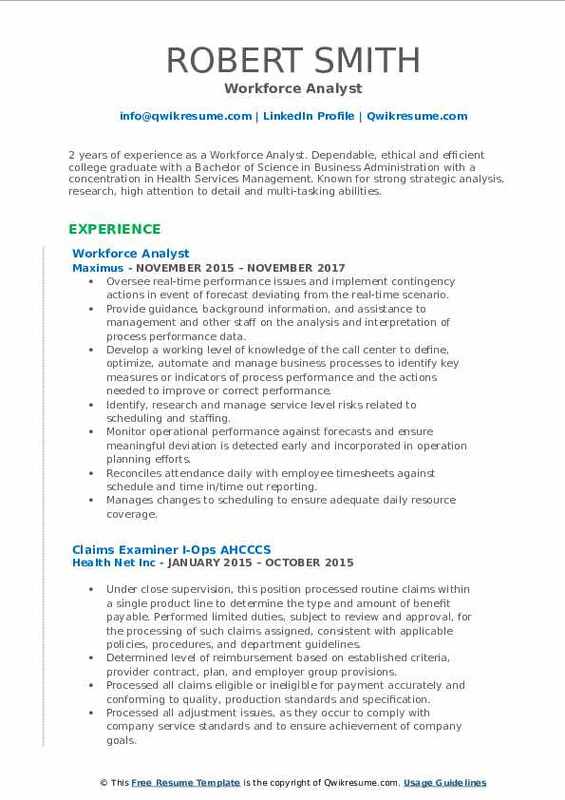 Headline : 5 years of experience as a Workforce Analyst is seeking to obtain a customer and accounts services position that will compliment my Experience, Skills, Education and most importantly my Ambition to succeed. Skills : Working Knowledge Of Avaya CMS, IEX, EWFM Tools Proficient In MS Office - MS Excel, Formulas, Pivot Tables, Creating Reports, Charts & Graphs, MS Word, And MS PowerPoint. Responsible for planning, creating and communicating forecasts and schedules for 3 regions (the Asia Pacific, the United Kingdom and North America) for single/multi-skilled agents. Maintaining the right headcount, calculating call capacity and ensure service level targets are met. Reporting and data management activities around scheduling and forecast. Weekly and monthly creation and review intraday-projections based on current staffing on business goals and requirements. Work with the WFM manager to ensure optimal staffing is achieved for each program. Work with operations teams to create and follow scheduling rules in line with the business requirement. Support the existing leave management process and ensuring that the schedules are updated on the tool accordingly. Manage the global shift bid process to implement schedule changes for the entire program on a quarterly basis (or the frequency needed by the business). Maintain confidentiality around strategies, practices and business information. Interact with real-time to enable them to manage the intraday operations on the projection.